What is it about driving that can turn a pacifist into a warrior, or transform Prince or Princess Charming into Freddy Krueger? As much as it pains me to say it, there are always going to be some people who will be aggressive jerks under any circumstances—and driving just magnifies that jerkiness to cosmic proportions. But there are also kind and good-natured individuals who transform before our very eyes into sneering auto-crats with the vocabulary of a Quentin Tarantino thug. Clearly, there is no single reason for the metamorphosis that occurs when an otherwise splendid human being gets behind the wheel of their vehicle—be it a Ford F-150 pick-up, a BMW, or a Toyota Prius. Some studies cite the protection and the anonymity offered by a heavy vehicle moving at high speed. Surrounded by a few thousand pounds of steel, we can name-call and chastise, knowing that similar behaviors directed back at us can’t actually penetrate the armor of our vehicles (unless the other driver is both psychotic and armed, then all bets are off). I think the fact that we’re nearly always in a hurry is a big factor, too. We’re just trying to get from here to there and aggressive or oblivious drivers slow us down. They get in our way and then they won’t get out of our way. All the while, the clock is ticking. There may also be a connection to a condition called “illusory superiority,” a cognitive bias whereby individuals overestimate their own qualities and abilities, relative to others(think Lake Wobegon, where, famously, all the women are strong, all the men are good-looking, and all the children are above average). In a famous study conducted some years ago, 93% of American participants rated themselves as above-average drivers. Even with my limited mathematical prowess, I recognize this to be a statistical impossibility. The same study also included Swedish drivers, for whom—somewhat more humbly—only 69% claim to be above average. So, if 93% of Americans are driving around feeling superior to other drivers, who’s to blame them if they express their superiority by refusing to yield, tailgating, speeding, flashing their lights, and honking their horns. And why should they use turn signals—they know where they’re going, why let the rest of us in on it? I’ve heard it said that if you really want to get to know someone, just watch how they drive. I don’t think that’s necessarily true. There’s something exceptional about driving—it takes certain people out of their day-to-day tranquil reality and drops them in a dystopian battlefield where they become someone else entirely, someone they’re really not all that proud to be. Again, I exempt the true jerks (jerkus americanus) from this acquittal, because they revel in letting their true colors fly as they terrorize the highways, speed the side streets, and assert their dominance across parking lots. I came across an interesting study that ranked all fifty states and the District of Columbia by the rudeness of their drivers. It also noted what other state held each state in particular contempt for its driving. Surprisingly (to me at least), Idaho drivers were ranked as the rudest of all, and they are especially hated by drivers from Arizona (a state which is ranked 34th and has as its nemesis the state of California). My own state, Washington, comes out pretty well, ranking 43rd in rudeness, and disliked most by our neighbor to the south, Oregon. Washington drivers don’t seem to hold particular animosity for any other drivers, while California drivers appear to hate nearly everyone. Given how highly-caffeinated Washington State drivers are, our ranking comes as a bit of a surprise. But, then, based on the number of venti Starbucks cups I see in drivers’ hands, I suspect we are all just looking for the next easy-access restroom. In yet another study of rude driving (there are many! 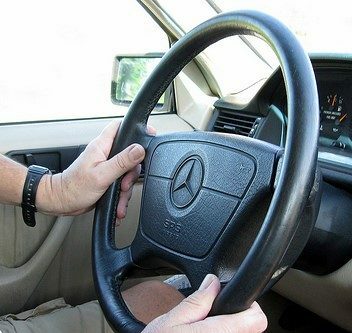 ), the author concluded that good and courteous drivers are “turned bad” by rude drivers. The courteous ones mistakenly believe that by venting their frustration they will let offending drivers know they have behaved poorly, so that they will not repeat the behavior in future. “It’s a contradiction,” says road safety researcher Lauren Shaw, “good drivers are using rude and unpleasant bad behavior to teach other drivers how to be better drivers.” All that does, she concludes, is confirm to aggressive drivers the bad behavior of all drivers. Is there way to conquer our own aggressive driving and not be provoked by the hostile or foolhardy driving habits of others? I think there is, but I suspect few people will like it. Here goes anyway: Let go of needing to be right (or righteous)—even when you know you are. Even when you’re absolutely, positively, without any doubt, certain you are right. Let it go. 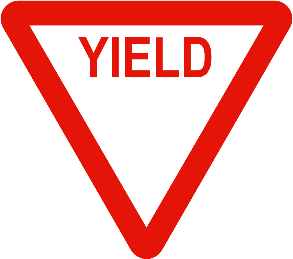 Yield. Let the other guy in—whether he’s merging onto the highway, trying to change lanes, or snatching up the parking place you had identified as your own. Even if it clearly was your space, or if he jumps in without signaling or waving thanks, what does it cost to acquiesce, and to do so without cussing and name-calling? Stop. Before you act aggressively or react to another driver’s idiocy or belligerence, pause and ask yourself if that’s really who you want to be and whether you will feel better or worse after yelling an obscenity or making that universally recognized hand-gesture. A pause offers us the option to be gracious and to put an end to escalating rudeness. 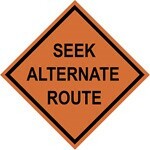 Seek Alternate Route. Remind yourself that you always have a choice, and when you make the choice—rather than allowing someone else’s behavior to make it for you—you’re not only exhibiting maturity, you’re modeling good behavior for others on the road or in your own vehicle. I don’t have the slightest idea what this sign means. But maybe it’s a reminder that we can’t always know what’s going on in someone else’s life that has made them behave aberrantly. Maybe they’re a brand-new driver and they’re terrified … perhaps they’re rushing a loved one to the hospital … possibly they’re lost…. Why not give the benefit of the doubt? Some people will never change. But if driving is one of the few places where you lose control and succumb to unkindness, challenge yourself to take another route the next time you get behind the wheel. See if you can find the road that leads to inner peace. This entry was posted in Driving, Kindness and tagged Automobiles, Cars, Driving, Extending Kindness, Kindness, Road Rage, Rudeness, Unkindness by Donna Cameron. Bookmark the permalink. Here’s an excellent article about kindness and driving to read as we head into the weekend. Donna, have you been riding in my backseat? Nearly every car ride entails me yelling “USE YOUR TURN SIGNAL” + whatever words you should not type in the comment section of someone’s blog post. If I’m alone, I will also talk to myself in answer to my gripes. “Well, that wasn’t very useful, was it?” My version of challenging myself, I guess. Instead of calling a careless or rude driver a foul name, I started coming up with names for them like Rumpelstiltskin, Raskolnikov, or Rufus T. Firefly. I discovered that I amused myself (it doesn’t take much!) and was no longer annoyed. Kind of silly, but whatever works…. Thanks, Michelle. I look like a little ole granny but behind the wheel, I get a heavy foot and I can’t hear the warnings. I have tried to slow down but I keep the lead in my foot on the pedal. Maybe someday I will find the solution. This article was insightful and even brilliant in places; probably why Tim posted it. Thanks for visiting and for your kind comment. I hope the Highway Patrol is never anywhere near when your lead foot is on the pedal! Donna, another winner! Your descriptions and comparisons are stellar. Hi, Cathy, thanks for your kind words. We have a lot of those long-wait exits on Seattle highways, too. I have chosen to believe that the people who cut in at the front do so because they 1) didn’t realize this was their exit and once they did, they weren’t able to get into the queue, or 2) they’re not from around here and are overwhelmed by our terrible traffic. I know there is also a third option, which is that there are people who jump the line every day—without even a pang of guilt—firmly believing they are more important than the rest of us and their time is more valuable than ours. Well, bless their hearts, one of these days, karma (or a patrol car) will catch up with them. Thanks, Donna. Excellent post, as always! Hah! Amazing, isn’t it, Mitch? 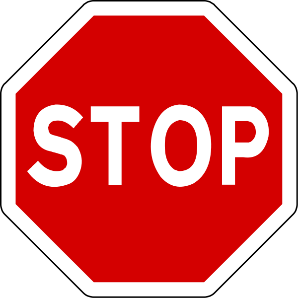 So many people appear to think “STOP” is merely a suggestion, like flossing daily or waiting 30 minutes after meals to go swimming. Thanks for your comment!